Player wages is a large part of the game and it affects everyone’s financial budgets. The following list basically shows you the average range of wages for each rating. In the making of this list, I’ve tested factors such as Morale, SM/Chairman’s Value, Age, Contract Length and Rating. My research has shown me that the Morale, AGE and Chairman’s Value plays absolutely NO role in wage adjustments. Also, the option of choosing the duration of the contract is meaningless in terms of player wages. In fact, the only variable is the PLAYER RATING itself. It is evident that the range of a players wage increases with a higher rating group. Also, the difference of range (i.e. Difference is 150 in the Ratings 65-69 group) increases with a higher rating group. MINIMISE your PLAYER WAGES TODAY !!! When a players rating decrease, so does his value. Some managers just let it be, however, if you offer him a new contract, his wages drop. In some cases this can be a dramatic drop. Offer all your potential risers 5 year contracts. eg, say you have a 70 rated player and by end of the real life season hes rated 88. He will still be on 3,200 per week rather than 21,000 per week which is the average wage for a 88 player. Have you considered the difference in having an 89 rated player and a 90 rated player? Well this post my startle you as the difference of an 89 rated player is MORE THAN DOUBLE of a 90 rated player in terms of player wages. 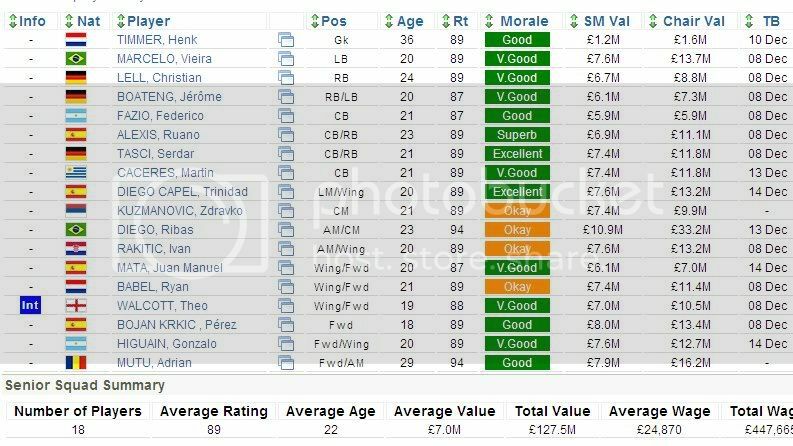 In fact, if you look at the above list, their is significant value when you buy players which are rated 94,89,84,79,74. Conversely, try and avoid (if possible) players who are ranked 90,85,80 (unless you are certain that they will rise in the near future ) as those rated players will often have similar wages to players with even a +4 better rank (i.e. 89 rated player and an 85 rated player have VERY SIMILAR wages). YOU WILL SAVE AT LEAST 100 000+ PER TURN MINIMUM IN PLAYER WAGES! This method can also be implemented in lower rated teams. This wraps up this second section about Player Wages. Hopefully, many viewers have benefited from the advice provided so far from this thread (Feedback welcome). The Difference in quality between both squads is fairly minimal. However, you can see that the difference in player wages is around 300,000. (Note that Leicester's player wage could have easily been higher (as high as 500 000 diff.) if I wanted to offer them new wages). . Lets say 400,000 is the saving per turn between the 2 squads. Mulitply 400,000 by 20 and thats an extra 8 MILLION in just 10 weeks. Lets not forget that the Leicester Squad is not entirely filled with 90+ rated players so indeed the savings would be certainly MUCH HIGHER than 400,00 a turn. This guide is basically advice for people who are looking to increase their finances by using the Buy then sell method over a 10 week period. This post is merely a small preview in what I hope may be an extensive money making guide in the near future . Firstly, Let us consider only +5 young risers for this first section. 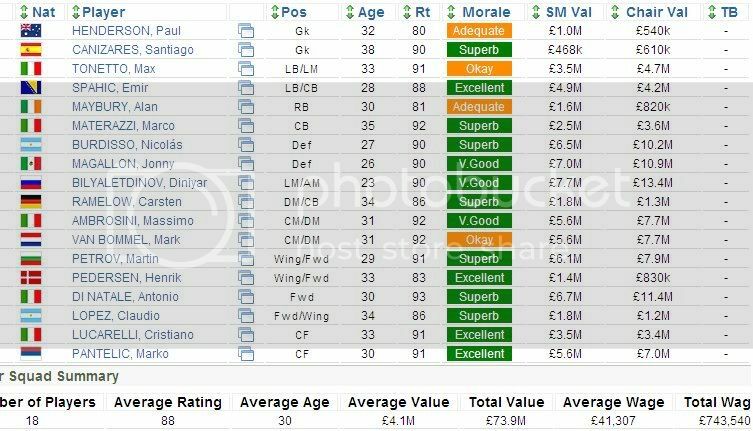 A 75 rated young player is valued at £547k SM Value on average. Now I know the chairman’s value will be different for each player so I’m making an assumption that it will be equal to the SM Value. A 70 rated player costs ~ £3400 per turn. A 75 rated player costs ~ £7700 per turn. An 85 rated player costs ~ £17 000 per turn. A 80 rated player costs ~ £11 800 per turn. (if they are both rising by 5). However, it is important to note that a small £10k investment may become 426k without the risk as SM seem to be very cautious over the last month in player rating changes. So, if your looking to invest in a player to make money and your bank balance is hovering on the 5 mill mark or less, i advise you to keep an eye out only for players around the 70 mark rather than the 80 mark. 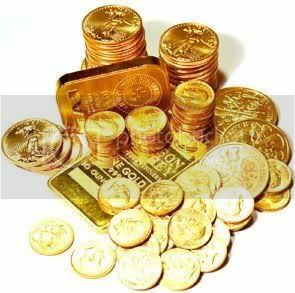 This will eliminate the risk of the player not rising and will also increase the chances of a greater profit. or an 80 rated player costing 2.17M has the potential to make 2.36M at the risk of 2.46M) n.b. (wages taken into account). sounds really good will be keeping an eye on this developing, rep once da players come. best of luck. Great post WillC, never looked into raisers at that perspective. Good post, but its worth remembering that 70-75 + 5 risers are much more common than 80-85 ones! Which is exactly what makes scouting so fun. GREAT thread here, WillC. Rep for you! Well done and a rep coming yer way! I'd like to point out the mistake about wages. If you buy a 70 rated player you pay £3300 per turn. If he then gets a ratings increase, regardless of the size of the increase you will STILL pay him around £3300 per turn until you offer him a new contract. I still have Gonul Gokhan, who I bought for 10k rated 71, now rated 88 and worth £6.3 million. He is still getting the £3450 per turn wages he got when I bought him. They won't go up till I offer him a new contract. That last point is a good one. One of my favourite setups is a custom league where i have quite a small club. Keeping wage bills down is very important. Thats why i tend to buy 88/89 rated players (earning 22k a week)who i hope will go into the 90s. which they would be on if i had just bought them. I always offer my players contracts if I know they will rise. Ben Arfa had a 3 year contract at £22,000 and I gave him a new 5 year contract (it went down to £21,500 some how lol). Now I will have a 90 rated player with lower wages than the average 90 rated player. I try to keep all my lower rated players on 5 year contracts, I'll do that as soon as I know they're going to rise if it's possible to do so. The same could be said if a player falls from 90+ to an 89 or below, renew the contract as soon as possible or you could end up paying double, if not triple, the amount of wages each week for that player. Try to do that at the beginning of a new season rather than at the end or you'll just end up losing a year on the contract anyway. Great thread! I could do with you for a couple hours a week working for my company! Great idea. I've tried to buy low-rated youngsters in the past in an attempt to make a profit, but I recently sold all those youngsters for only a little profit. Maybe if I had a list of ten or so 70->75 risers, this could work, and make profits in the long run. Repped. These are two great methods. I will be posting a detailed 3rd method which has been a secret of mine for 2 months. Posting in ~15 minutes so keep in touch . This wraps up this second section about Player Wages. Hopefully, many viewers have benefited from the advice provided so far from this thread (Feedback welcome). I will also tweak around with my opening post in the near future as it does need fixing . Will, this is some great work but to add to it, I believe age makes a difference to wages aswell. Older they are, more expensive the wages are. Historically I have tended to go for 89 rated players because i was aware of the wages differential, but had never sat down and done the maths (strange since i am an accountant!). Also I didn't appreciate the differentials further down the scale. I have finished my first season (getting Sheff U promoted to Div 1 as champions) and promotion was the primary objective at any cost. Consequently I tended to go for players rated 91/92 just to be better than my opponents. However, now I will definitely bear this in mind. Before reading your post I was looking only at 89 rated players that I thought would rise, but it is good to be reassured that I am doing it right. In the making of this list' date=' I’ve tested factors such as Morale, SM/Chairman’s Value, Age, Contract Length and Rating. My research has shown me that the Morale, AGE and Chairman’s Value plays absolutely [b']NO[/b] role in wage adjustments. That's incredible. So my 90 rated RB Gary Neville is being paid twice as much as my 89 rated LB Fabio Aurelio, and the difference in rating is just 1?! That saying, money isn't really a massive object for my Leeds team (I somehow wriggled my way to the Cup Final), but for my lower league teams I will definitely start buying 79s instead 80s, in an attempt to save some cash.